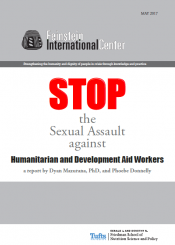 This report contributes to understanding, preventing, and responding to sexual assault against aid workers. It provides detailed recommendations to assist agencies in preventing and responding to sexual harassment and assault against aid workers. Our findings are drawn from a review and analysis of 78 articles and reports, 24 security-training materials, 2,423 survey respondents from Humanitarian Women’s Network and Report the Abuse studies, 57 testimonies from women and men who are survivors of sexual harassment and assault, and 30 in-depth interviews.